Burgess Excel Light Rabbit Nuggets with Mint is ideal for those rabbits who have a tendency to become overweight due to a fairly inactive lifestyle or an unbalanced diet. Each and every tasty nugget is nutritionally balanced with fewer calories and higher fibre levels to make the ideal weight watcher diet. Excel Light nuggets provide a wholesome balanced diet in every mouthful to prevent selective feeding. Excel Opti-Weight Regulator to help reduce and then stabilise the rabbits weight. Reduced calorie content to encourage weight-loss. High fibre content: essential to keep the digestive system working effectively. My roly rabbit does well on these Excel Lite pellets. Being that they are half the calories compared to normal Excel pellets I like to think they help prevent her from gaining more weight. The Burgess nuggets are very popular with my bunnies they always clear their bowls. 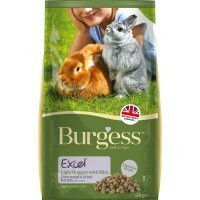 My buns love all of the Burgess Excel products. They practical tumble over each other to get to the bowls, like I haven't fed them for days, every morning and evening. This has been great for my food obsessed buck, who was overweight when I adopted him. He's still a little chubby fluffbutt, but less so than he might be!